If you’re in the market for a simple minivan, the 2016 Kia Sedona is not for you. 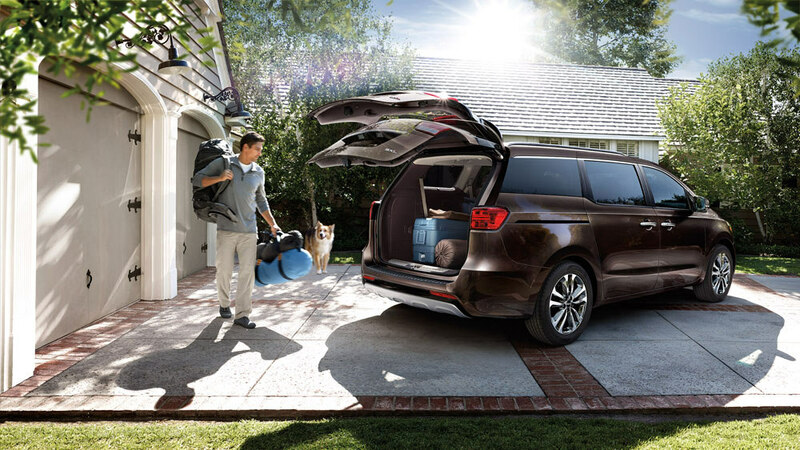 However… If you’re looking for the next step in evolution of the minivan, the future of family transportation that’s a fortress of cutting-edge technology, then the latest Kia Sedona is what you need. Set yourself apart from the numerous other people-movers on the road with the best Kia has to offer with the 2016 Sedona. The 2016 Kia Sedona runs on a 3.3L V6 engine. This van is not your ordinary mini-van. The 2016 Sedona can achieve up to 24 mpg highway and 18 mpg city**. Operating on a six-speed electronically controlled automatic overdrive transmission with Sportmatic, the 2016 Sedona generates 276 horsepower and 248 lb-ft of torque. You won’t be sacrificing power with this family-friendly minivan! The 2016 Sedona has impressive standard exterior features including: Projector Beam Headlights, Solar control front windshield glass, Rear spoiler, Locking fuel-filler door, Variable intermittent windshield wipers, and Heated rear glass. If you want more convenient interior features, take a look at some of the higher trim levels where you can find more exterior features including: Privacy glass, Positioning Light String LED lights, Power-folding outside mirrors, Roof rails, Front door window solar control glass, Heated outside mirrors, Smart power height adjustable liftgate, Front fog lights, Jewel-type LED positioning lights, LED rear combination lamps, Projector beam front fog lights, and/or Dual power sunroofs. Find all of the exterior features you need to keep you and your family safe on the road while driving in style! The 2016 Kia Sedona has a great interior designed to keep you comfortable! The 2015 Kia Sedona comes standard with convenient interior features including: Slide-N-Stow second row seats, Center console with armrest, Dual glove boxes, 50/50 split-folding third row seats, Conversation mirror, and Day/night interior rear-view mirror. Stay entertained with standard radio and technology features including: Bluetooth® Wireless Technology hands-free connectivity, AM/FM/CD/MP3/SiriusXM® Audio System with 4.3-inch touch screen audio display, Rear-Camera Display, USB/Auxiliary input jack, 4 speakers. On higher trim levels you can find interior features such as: 3-passenger second row seating with fold down center console, 8-way power driver’s seat adjustment, Leather seat trim, Cooling glove box, Auto-dimming mirror with HomeLink®, Heated front seats, Tri-Zone automatic climate control, Leather-wrapped steering wheel, Carpeted floor mats, Ventilated front seats, Heated second row seats, Integrated memory system, 8-way power front-passenger seat adjustment, Premium Nappa Leather Seat Trim, Leather-wrapped and wood-style steering wheel, First-Class lounge seating, and/or Wood-style trim for front and rear doors. On these higher trim levels, the radio and technology more advanced too! No matter if it’s you or the kids, sit back and enjoy the following features: Dash-mounted Tweeters, UVO eServices Infotainment system, USB 2.1 charger ports, Back-up warning system, HD radio, Blind-Spot Detection system, 8 speakers with center channel and subwoofer speakers, Voice-command navigation with 8-inch touch screen display and SiriusXM® Traffic, Rear Cross Traffic Alert, Infinity® Surround Sound Audio System with External Amplifier, Parking Assist with front and rear sensors, and/or Surround View Monitor. Some of the standard safety features on the 2016 Kia Sedona include: Rollover Mitigation, Full-length side curtain airbags, Cornering Brake Control, Side-Impact door beams, Electronic Brake-Force Distribution, Traction Control System, Hill Start Assist Control, Front and rear crumple zones, Vehicle Stability Management, and Dual front advanced airbags. Be sure to stop into Carriage Kia and experience something new in a 2016 Kia Sedona today! With our large inventory, our team here at Carriage Kia loves helping our customers find the perfect new car or used car for them! Please feel free to contact us if you have any questions or would like to schedule a test drive!